Vegan Nutritionista's Vegan Bytes #14 -- How Super are Super Foods? *Your questions: "Are super foods really that good for me?" 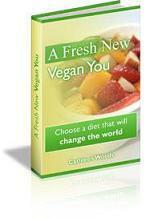 My first ebook, A Fresh New Vegan You, will be available on June 16th. Watch your email box next week for a special deal that will only be good for the first week. As a VIP subscriber, you will hear about it before anyone else! People come to veganism for a variety of reasons; some hear they can lower cholesterol levels and lose weight, some want an end to diabetes and insulin treatment, some are trying to reverse heart disease, others hate the thought of harming animals, while still others want to be true environmentalists. Some people are just curious and would love to eat healthier, but don't actually want to cut all meat out of their diets. Others are willing to try a vegan diet, but they want guidance. Whether you are a brand new vegan, have been one for 20 years, or are just considering eating more vegetables and fewer meats, you are in great company. About 7 million Americans call themselves vegetarian; half of them are strict vegetarians, vegans. Across the world, about 6% of people eat very little meat, 30% are trying to eat less meat, and about 2% are vegans. Today's vegan isn't just your incense-burning, hippie, wacky single aunt's vegan. Today's vegan could just as easily be the buttoned-up wife of three who works in the cubicle next to you. It could be the bodybuilder neighbor who's always at the gym. It could be a Southern rural family or a city dweller. Veganism has a brand new face, and even the most fundamental hippies welcome the company. You might be vegan strictly because you've learned that a plant-based diet will help reduce your risk for developing many cancers, heart disease, diabetes, and numerous other harmful illnesses. Or maybe you're more concerned about the ethical issues behind eating another species of animal. Or you might be a huge environmentalist and you understand that animal agriculture produces more of the planet's greenhouse gases than the entire transportation industry. Or maybe you believe in all of the above. Veganism as a lifestyle is growing rapidly across the world. There are directories of vegetarian restaurants for almost any city you want to visit, there are giant health food stores that even the most conservative people frequent, and there are hundreds of great vegan cookbooks and websites. Overall, people are starting to get it. Slowly, the media is leaking stories about factory farm abuse and the benefits of a plant-based diet for prevention of diseases. For the most part, people seem to know red meat isn't healthy for them. We're starting to hear murmurs about how the meat industry produces more greenhouse gases than the transportation industry. In most big cities, when I'm at a restaurant spewing out my standard, “Does this have any milk, cream, cheese, or meat stock in it,” rather than getting a blank stare and having the waiter run back into the kitchen, now the answer is, “No, it's vegan.” They get it. I no longer feel like a complete shrew when I go to a party and have to ask if I can bring a dish to accommodate my dietary concerns. There are already plenty of vegan dishes planned for the party. We still have a journey to travel. Tofu still gets picked on. It never ceases to amaze me that food and cooking networks can so blatantly ignore a lifestyle trend that is picking up steam. People still spread rumors about protein and iron, and vitamin B12 deficiencies are a real (unfounded) fear. But, it's now much more fun to travel the road to a more plant-based worldwide diet. Because the vegan food world is exploding in such a huge fashion, so is the vegan junk food world. It is now possible to get cookies, cakes, sodas, candy bars, ice cream, pizza, French fries, potato chips, and everything else you can imagine, all made without any animal products. And while those things are fun every once in a while, they are not truly the way to a healthy vegan diet. You will not see the same benefits of reduced risk for disease, weight loss, and overall energy and vitality from eating junk food, vegan or not. Many of the fake meats and junk foods can help when you are making a transition from a meat-based diet to a plant-based diet. They can fill the urge for a hamburger really well, as many “fakes” are good enough nowadays to pass for the “real” thing. Most of those urges are more psychological than physical, so feeling like you are eating junk might make your move easier. Eventually though, you will need to learn to eat more whole foods and fewer processed foods if you want to lead a healthier life. Learning how to balance your diet, and really focus on the whole plants, is the key to great vegan health. And it doesn't mean you need to eat rabbit food. It can still taste delicious. Fair Winds publishing company recently sent me two new vegan cookbooks to review. I was so excited to be offered copies and to try these books that had such good reviews. 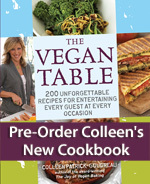 The Vegan Table, by Colleen Patrick-Goudreau, is an amazing collection of recipes and menus for entertaining. There are options for casual dining, formal meals, and romantic dinners. Colleen has the book divided based on the seasons. So far, I love the sesame miso dressing for greens, the swiss chard and caramelized onions, and the traditional lentil loaf. I've already read the book cover-to-cover a few times and am planning to make everything eventually. It all looks delicious. The second book I reviewed was The Vegan Scoop by Wheeler del Toro. Wheeler is the founder of Wheeler's Frozen Dessert Company in Boston, MA. After hearing all over vegan blogs about how good Wheeler's ice cream is, I was excited to get this book. The ice cream recipes are all really simply-- most recipes are no more than a handful of ingredients. What I love is the imaginative flavors like Chocolate Pretzel, Lychee, and Jalapeno. Most of the recipes use a soy base, but there are instructions on how to substitute in other nondairy milks. It seemed like ice cream week because just before the two cookbooks got here, Soy Delicious sent me a huge supply of their new product line. They've been making ice creams with coconut milk for about a year now, and I wholeheartedly endorse them. There's only a slight coconut flavor in the background, so if you're not a coconut fan, you will still probably love this ice cream. The milk makes the ice cream so light and fluffy, and the brightest white color you can imagine. 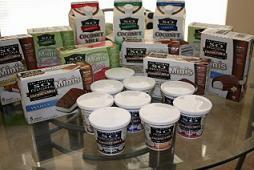 We sampled ice cream sandwiches, chocolate covered bars, fruit bars, coconut milk, and coconut milk yogurt. The yogurt reminds me of "custard style" yogurt from childhood, but only in flavor, not in texture. The texture is smooth and light. They have a few different fruit flavors, as well as chocolate, vanilla, and plain. I also like that the lids have cute little facts about coconuts on them. I've heard a lot about superfoods and especially acai. What do you think about "super foods?" Are they really good for you? That's a great question. I think there is a huge amount of hype about super foods, and as with many things that get hype, it's often a way for marketers to make money. That being said, there certainly are some fruits and vegetables that have more nutrients than others, and if you eat some or all of them, you are getting nutrient packed food. The one "super food" that we can't easily eat in its whole form, and that is the acai berry. Acai (pronounce a-sigh-ee) is a berry grown in the Amazon that is extremely fragile and perishable, so it can't be transported whole to the U.S. Some people say it has been shown to help improve energy, digestion, mental clarity, sleep cycles, the immune system, sexual desire, circulation, skin clarity, and visual strength. It reduces inflammation and free radicals, and can fight cancerous cells, and maintain healthy heart function. It's even been shown to alleviate diabetes and prevent heart disease. My favorite brand of acai is Sambazon because I feel that they provide the least refined and most like its whole form of the berry. It's also organic and the company is working to help the Amazon rebuild its rain forest. I prefer to get the frozen smoothie packs that are unsweetened and don't have any added sugar. We add a pack to our fruit smoothies. Last week we tried an awesome dish at Whole Foods and I set out to figure out how to make it. It was spinach with cashew cream. Now, since WF labels their ready-made dishes, I can't say I had to work hard to mimic the dish. But, they tried to trick me by calling the last ingredient "spices," even though it was obviously just nutmeg. Blend all ingredients (except spinach) in high-powdered blender (I love my VitaMix for this job) for 1 minute, until it becomes thick. Taste for flavor. Pour over wilted spinach and serve, warm or cold. One of the most fun new things on Vegan Nutritionista is that we are now able to take free submissions from you... the VIP members!